To most, Drystan was just another buffoon in the collective of clowns. But behind the inane grin, he saw everything, keeping the secrets he discovered close, like precious gems to barter. Mutiny is brewing in R.H. Ragona’s Circus of Magic. When Linden, the leader of the clowns steals one of the ringmaster’s most prized possessions, Drystan, the white clown, finds himself caught in the middle. Tasked with retrieving the Lethe, he’s forced to betray Linden or risk his troubled past coming to light. But the Vestige artefact has its own history and its own power. Drystan will learn what it can really do, and who it can hurt. 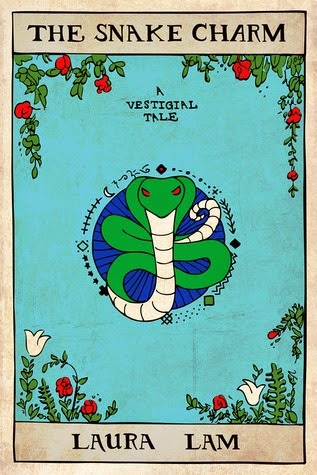 The first Vestigial Tale came out two days ago! It's a little prequel story to Pantomime, and you can go buy it off Amazon (lots of links here). It stands well on its own, so you can read it even without reading Pantomime first, but you'd probably be able to enjoy it a lot more if you have read both Pantomime and Shadowplay. I liked this a lot! You all know how much I loved Pantomime and Shadowplay, and the universe of these books. This was an interesting look at a powerful and potentially terrifying Vestige artefact (I think it's pretty cool that these tales are all going to be centred around different Vestige artefacts, because they're fascinating and I can't wait to learn about other artefacts! ), and I liked getting to know Drystan a bit more. What he was like at the circus, before Micah came along; the touch of loneliness in him. The way he quietly observes, and always keeps his true self hidden. It makes me all the happier that I got to see him the way he was in Shadowplay, so much more open, all the trust he showed in Micah in that book (and the trust that Micah showed in him!). I also liked the glimpses of Frit that we got in The Snake Charm. If you know her story from Pantomime, you'll know that it is a very sad one, and that's the case here too, somehow sadder for the hint of hope that still lingers in her. I only wish this story had been longer! I really want to spend more time with Drystan. I just am not very used to reading short stories most of the time and I feel like with a short story of this length, by the time I'm really getting into it, it's already over. I like to have more stuff to sink my teeth into. The Vestigial Tales are going to be of varying lengths though, and some will be longer, so I'm really looking forward to the rest of them! There'll be a collection - probably next year or so! There's 4 stories this year and probably a few more next year after the third book is out. Thanks for the review, Cynthia! :-) The other Drystan novella is longer - probably about 25k.